﻿ Evason Ana Mandara Nha Trang Resort (Vietnam) | FROM $180 - SAVE ON AGODA! "Great place, the only one resort with private beach just a f..."
Have a question for Evason Ana Mandara Nha Trang Resort? "Had a very enjoyable six senses spa at Evason." "Second time visit - lovely and peaceful as usual compared to the chaos and noise outside." "T 3/ The spa was super excellent." "Wonderful resort in downtown city of Nha Trang." Staff: universally amazing, so helpful and friendly, nothing was too much trouble for them. The standards throughout the hotel are of the highest. We had a room overlooking the beach, what a way to wake up! We didn’t want to venture out of the hotel as we had all we needed. At about 11.30 each day whilst on a beach lounger, a man from the hotel would come along and distribute fresh water melons, minutes later he would return with refreshing hand and face towels. Breakfasts were great; the food overall was equally good with a wide range of Vietnamese food; Asian and Western options. I cannot recommend this hotel enough. The staff was amazing and so was the room and facilities. The hotel was nicely located with a private beach, but the best restaurants and bars (other than the hotel’s, which were great) were a short taxi ride away. I staied here 1 days, I really dislike leaving this resort. First of all, the resort is located very conveniently. And the staff (including doorman, bellboy, housekeeper ect )was very kind. N infinity pool has good view. I was worried about the noise from the road, and mosqito but, there was nothing bothering me . And 'KIMCHI' was served in the restaurant. I staied at the gardenview room, so I hope to stay seeview room next time. I was also satisfied with welcome juice n fruits. Evason ananamdara would be remembered forever in my memories. Staffs were very kind and provided excellent service. Great location, clean, nice beach and pool. Breakfast buffet was wonderful and Bar service also great. Everything was wonderful and had a great experence here. It was a super nice resort with friendly staff but I didn’t really like how often they would go into your room when you weren’t there. They would come in once to clean your room (even though we put up the “do not disturb” sign) then come in again at night whilst you were at dinner to prepare the bed for sleeping (fold back corners of bedsheets and place a treat on the bed). It was nice of them but it felt a little bit like an invasion of privacy. it was great time with evason! i hope to book this resort again if i have chance to visit Nha trang again. Especially, the staffs are very kind and helpful. Also there are no more better direction than Evason resort. Strongly recommend for all of traveller. my stay at evason ana mandara was simply fantastic. we were offered to switch to beach front suite for a rate of less expensive room and it turned out to be a great decision. the suite was literally right in front of the wonderful private beach and the view was just amazing. They offered all kinds of special pillows and i asked for a pillow that helps to reduce snoring and my wife said it really did work. I liked that they had a separate pool for children so adults unaccompanied by children were able to enjoy quiet main pool. We enjoyed everything @Ana mandara ... Enjoyed wonderful breakfast, took a walk on the beautiful white-sand beach, went to the Nha Trang market with hotel's rental cycle, then swam in the beautiful swimming pool, rested at the beach, took the wonderful Spa massage.... In the midnight , suddenly I got a heavy sickness....The next morning, they brought me the tablets , ginger tea and ginger rice porridge...and very worried about me. So I recovered from the sickness quickly and was able to continue the trip. Thank you for the nice staffs! This hotel is very best !! 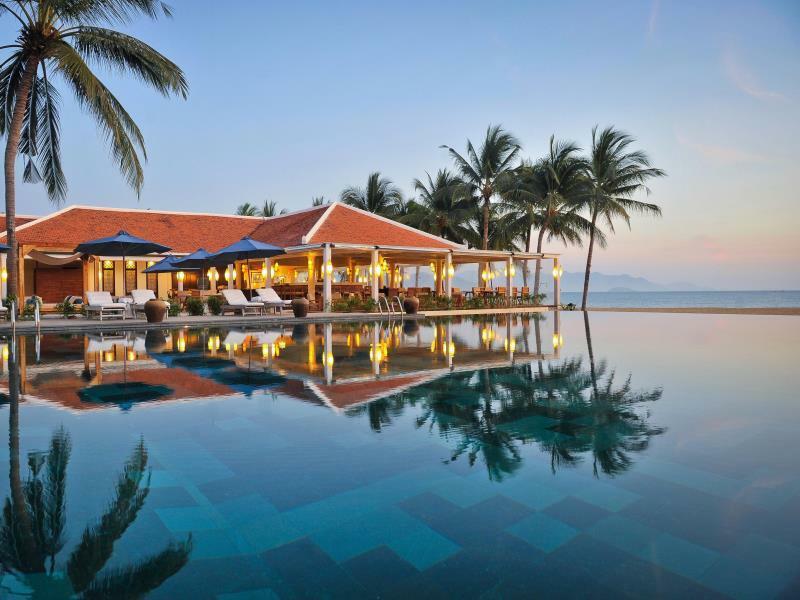 Ana Mandara Nha Trang is a pleasant resort. It's very nature oriented despite being in the middle of the city. It offers the best of both a city hotel and a beach resort. However, because it is what it is, the resort is quite small compared to other more recent resorts. Also it is one of the very first resorts in Nha Trang so in term of design and breakthrough concept, it's a classic resort. If you're looking for a relaxing city stay, this is the right resort for you but for fussier guest who want total tranquility and stay in the heart of nature, this is not what you want! Hope this review helps. We stayed at Ana Mandara for only one night but we wished we could've stayed a little longer. The hotel itself was remarkable and it makes you feel like you're staying an exotic place. At fist you entered, the staff greeted you and lead you to sit down right away to rest instead of standing up and checking in. The staff checked you in while you sip on lemonade and passion fruit sorbet. The staff in the hotel were all very nice and helpful. We did 50 minute Vietnamese massage and it was excellent! The pool of the hotel has a spectalcur view of the ocean. Ana mandara has it own private beach so it is not crowed it at all. Also this hotel is conviently close to town. Great location, 10 steps to the beach and a walking distance to the Nha Trang central. staff here are extremely friendly and polite here. The setting of the resort is beautiful and cosy. My husband and I had a full body massage, all my god, we felt so great after the massage. The food was ok, not so great and distinctive compared to the Six Senses at Ninh Van Bay. The food is outstanding - every meal was a culinary delight with variety, taste and freshness that kept on surpassing my expectations. Staff were friendly, engaging and relaxed, yet professional and really interested in making our stay worthwhile. And they succeeded. The setting is gorgeous, close to town, yet on the beachfront with enough peace and quiet to forget about noisy traffic and life elsewhere. Rooms, bathrooms, restaurants and other spaces in and around the hotel simply a joy to be in. I did not want for anything, and I didn't want to leave. I will definitely come back if I get the chance, and have already recommended it to friends. It is expensive, and we would have liked to stay longer, but felt it was worth the money even for a short while. This resort is an absolute must! Located at a beautiful private beach, this resort is just amazing. The rooms are beautiful and clean, the beach is divine, the food and drink is amazing, and the service offered is superb. The resort provides free sunloungers, umbrellas, and beach towels, and provides a food and drink ordering service from the comfort of your lounger. This is somewhere my partner and I are definitely coming back to!! kind people, nice location, very comfortable atmosphere. I wish I can visit to here again. We loved our little villa. Breakfast was delicious. Beach was gorgeous! Pools are great. Staff was amazing. Would go back in a heartbeat. +ve points: Garden room location was very good, only a few steps from the beach. Private beach. Friendly staff -ve points: The bedroom area was a little small to accommodate for 3 people sharing with one additional bed. The additional mattress was hard and less comfortable. Wonderful resort in downtown city of Nha Trang. It takes 40 minutes driving from airport and it is located in downtown city, very convenient to go round the city. The resort environment is lovely and relaxing and right next to the beautiful Nha Trang Beach. There are 2 swimming pools and one is an infinity pool facing amazing beach. Resort has 2 restaurants, food was good and cocktails are nice. They have different promotions on drinks and food every day for guests. The spa service and treatment is great too. So we stayed here for 4 days and we loved to stay in the resort most of the time and don't even want to go outside the resort. Room itself is clean and tidy, only comments is the mosquito problem. But hotel provides mosquito coil. Highly recommended this resort with good service, convenient location, beautiful view and facilities. I will probably come back to this resort when i visit Nha Trang in future.